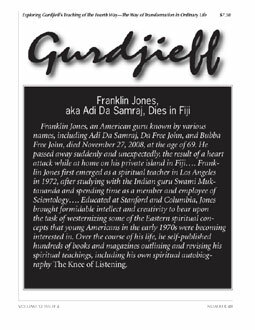 The self-exiled teacher and self-described Avatar of our Age lived among his devotees for some 23 years on his own island in Fiji. His first teacher was Albert Rudolph, aka Rudi, a former Fourth Way student who had "the Force." What is the Hindu view of self and soul? The story behind why Gurdjieff asked Ouspensky to stop teaching. The part played by Orage and Mrs. Page has been known but not that of Orage's mistress, Mrs. Clifford Sharp, aka Rosamund Bland. Machines or Son of God? Gurdjieff says we are both. How to reconcile the two. What can be learned from the passing of a seeker of truth. Comparing the teaching of the Stoics with that of Gurdjieff's. An account of walking the labyrinth for the first time. Self-published author John Henderson thinks he has broken the code to Gurdjieff's writings and anoints as "Patriarchs of the Work" C. S. Nott, A. R. Orage and Frank Pinder. "Everyone comes to the emptiness of life. It takes real guts to see its hopelessness."